The following passes will get you into the Creator Complex. 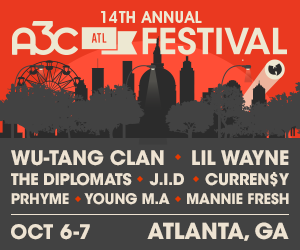 A3C's Creator Complex will connect artists and producers with creative professionals and company experts to create valuable digital assets and provide actionable insight. YouTube, Landing Lion, AKAI, Sounds.com, Native Instruments, Motion Family, Gray Matter Collective, Scratch DJ Academy, SocialWerk, Wish Creative Media and LANDR. 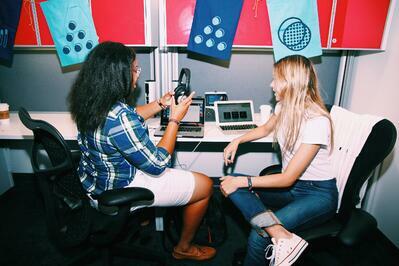 Join the YouTube team in the Artist Lounge where you'll be able to meet us 1:1, optimize your channels with an audience development specialist, use YouTube Live, partake in feedback sessions, and create content for your growing YouTube channels. Creators will sign into Sounds.com and be given a sound pack to work from and 90 minutes to make the best track you can. Special industry judges will pick the 3 best remixes per session to receive a brand-new software package from Native Instruments. Create a website with a Landing Lion professional in just half an hour, which will help you build your brand and amplify your music career. Team Akai will be on hand all day to showcase the hottest production tools, the MPC X and MPC Live. We’ll also be unveiling some top-secret, unreleased goodies. Step into the lab and demo the music-making tools that will give you the jump on the competition in 2019 and beyond. Resident photographers will be shooting headshots and full body profiles. Artists will be provided between 3-5 unmarked head shots and/or full body profiles within 14 days. Native Instrument Product Specialists & guest producers will be available to give you guidance in exclusive 1 on 1 sessions for producers and artists and answer any of your technical questions. Instant mastering for a maximum of 15 tracks, but no cap length on songs. Masters will be sent automatically via email once completed on-site. Track(s) via USB or DropBox/WeTransfer link. Additionally: 1 month of unlimited instant mastering and free music releases to Spotify, Apple Music, iTunes, Deezer, and all major streaming platforms. 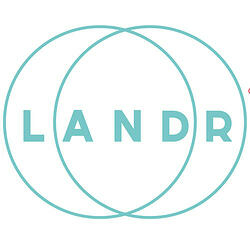 Chance to win a 1 year Pro unlimited LANDR subscription. World class turntablists and DJs will add some additional flare to your original track to stand out. Press professionals will review, consult and edit press releases and artist bios. Artists will leave the sessions with a professionally written bio and/or press release. USB or DropBox/WeTransfer link with current bio and/or press release. SocialWerk representatives will do candid 1 on 1 Social Media Audits with Creator Complex Attendees to identify strengths and areas of opportunity on their various social platforms and help create a basic plan going forward for their online presence. Writers/topliners will be able to submit for an opportunity to work closely with WLPWR [producer for Eminem, Wiz Khalifa, Yelawolf, Big Krit, Asap Rocky, The Game & more] for potential sync opportunities in film, tv and video games. 10 Selected writer/topliners will choose beats from WLPWR & team, write and record based on descriptions presented for said sync opportunities. Resident photographers will be shooting headshots and full body profiles. Artists will be provided between 3-5 unmarked head shots and/or full body profiles within 7 days. Graphic designers will review an artist’s brand, provide consultation and develop a creative brief during the session. Graphic designers will deliver a brand guide with logos, colors and fonts within 14 days. Artist must bring = Existing brand assets, links and images. Sit down with A-King (Combat Jack Show / Loud Speakers Network), the host of "In The Lab " to record a podcast interview. Audio file of interview will be delivered to artists within 14 days. 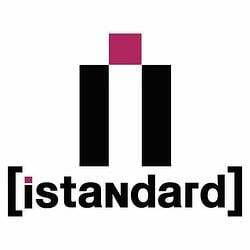 A compilation of artist interviews will be released on In The Lab podcast. Artists must bring: A phone with an AUX port and a song ready to plug in and play. 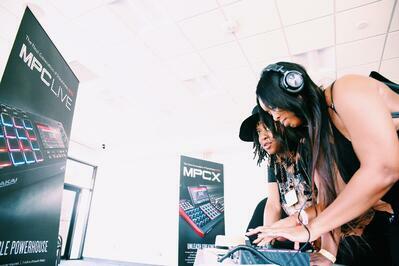 Make fire beats at the MPC Live and MPC X demo stations. MPC specialists will be on hand to answer any questions and provide pro-tips. Instant mastering for a maximum of 15 tracks. Masters will be sent automatically via email once completed on-site. Additionally: 3 months of unlimited instant mastering and free music releases to Spotify, Apple Music, iTunes, Deezer, and all major streaming platforms. 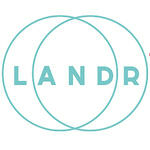 Chance to win a 1 year Pro unlimited LANDR subscription. Artist must bring = USB or DropBox/WeTransfer link with current artists bio and/or press release. 7-9 producers will be stationed at a conference table, seated at every other chair. 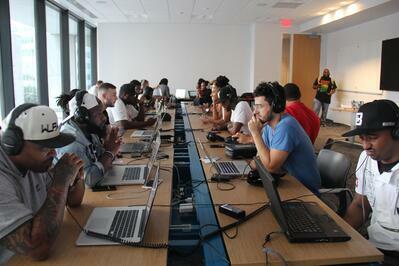 Producers must bring their own laptops, with beats, and 2 sets of over-ear headphones. Artists must be prepared to play 1 song on either their cell phone or with a USB flash drive. 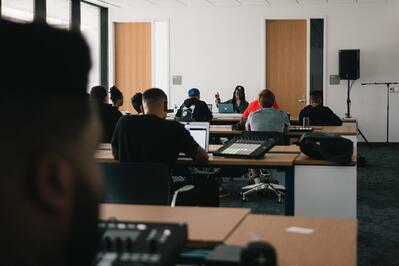 Following each sessions there will be a mixer for artists and producers to exchange information and build. Breakout sessions are 60 minutes in the adjacent room. This room is for beat makers that love to flip samples. 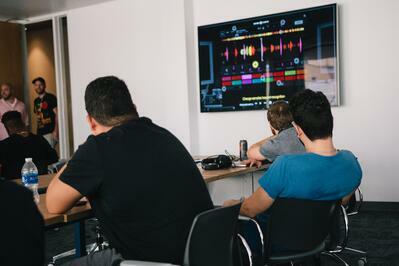 To participate, producers will have to manipulate the samples using Serato Sample. Producers must bring their laptops & headphones to use for the Sample Flip. Producers will be given a USB with a sample to flip, along with a 30 day free trial of Serato Sample. Producers will flip samples using their drums and additional sounds. Work stations with tables and chairs will be provided. Serato Sample is a VST/AU plug-in that officially supports Ableton, Logic, Maschine, FL Studio. Producers must bring: Headphones, laptop, drum machine, keyboard and charger or power source. Additionally: After 2 hours, a special guest producer will listen to and judge the producers. A prize package will be awarded to the top 3 beats, as chosen by the guest judge. About: Serato Sample is a powerful and intuitive new Sampler plugin for producers that allows you to quickly find, chop, key shift and time-stretch samples. Find out more at www.serato.com/sample. As an attendee of the Creator Complex you will receive special access to the Squarespace Studio, where you can create a Squarespace website that will help you build your brand and amplify your music career … in just a half hour! Book a 1:1 consultation with experts from Squarespace, the leading web-publishing platform. Sign up now at creatorcomplex.squarespace.com for your free half hour consultation between 10 AM and 10 PM on Friday, October 6th. Want to connect and collaborate with up-and-coming artists? Want to donate your time and use your talents to help independent hip-hop artists? Want to showcase your skills, build your network and gain new clients? If you answer "Yes" to all of the questions above, then fill out the application. The Creator Complex is a space for creating. There are no mentorships, workshops, seminars or presentations. Each sessions should result in the creation of new media or connecting future collaborators. Independent hip-hop artists have limited time and resources. They often spend a majority of their time writing and recording music, and far too little resources on their brand and creative assets. It can be overwhelming and expensive. However, artists only get one first impression and a short window to convince someone to "like" "listen" "watch" "share" "buy". To be successful, it's essential to present yourself as best as possible and make each opportunity count. Link artist with professional creatives to review and develop assets that independent hip-hop artists can use to help their careers. Artists can create - and own - tangible media assets to better present themselves, connect with fans and further their career. A3C will program dedicated spaces for 1-on-1 and/or group sessions with well-respected companies and talented creative professionals. Creative sessions may range from a few minutes to an hour. Where is the Creator Complex? 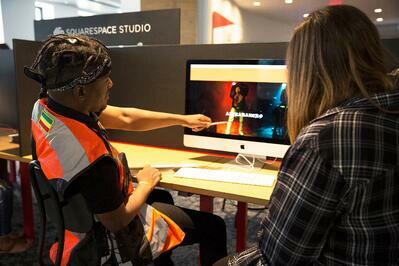 Georgia State University's Creative Media Industries Institute (CMII) mission is to contribute to Atlanta’s emergence as a global creative capital. CMII was formed to strengthen connections between arts and media students and the region’s creative industries. 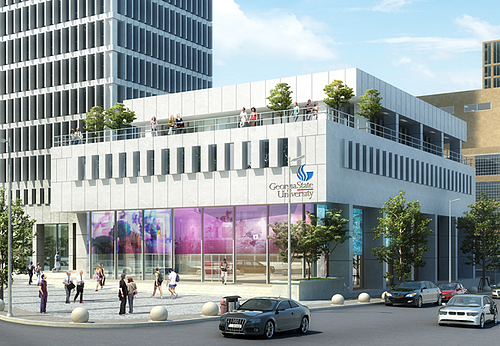 CMII is a creative media/arts center with production and post-production studios, research labs, and entrepreneurial suites.